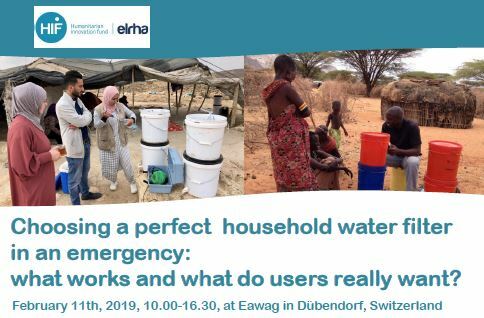 Household water treatment and safe storage (HWTS) devices are an essential element within humanitarian emergencies to improve quality of drinking water and achieve health impact. However, evidence that HWTS products are used correctly and consistently in emergency settings is limited. To increase the ability of Humanitarian Agencies to make informed choices about the procurement and distribution of household water filters in emergencies, and motivate producers to improve design, Humanitarian Innovation Fund (HIF) initiated this project. on the technical performance of the filters regarding use, flowrate as well as bacterial removal. We have differentiated between filter integrity, post-contamination and microbial re-growth to obtain more in-depth understanding of the challenges and limitations of different products. ease of use, operation and maintenance, functionality, size and aesthetics from the point of view of the users. The users and implementers were involved in different ways including structured surveys and observations, as well as open end discussions and a co-design workshop. optimization potential for different products to better suit needs of users and implementers. And finally, contribute to design a better filter!